The Dual JD Program is a rigorous program designed to immerse students in two legal cultures. Because of our proximity to the International Border between the US and Canada, and the fact that our campuses are approximately 20 minutes apart (including border crossing), we are able to offer an integrated approach allowing students to learn both Canadian and US law at the same time. Students in the Dual JD Program are required to complete at least 104 credits in three years between the two institutions – 60 credits from Detroit Mercy Law combined with 44 credits from Windsor Law. Of the minimum 60 credits through Detroit Mercy Law, students will complete credits in required doctrinal courses, a Law Firm Program course, a Legal Clinic, an Upper Level Writing course, six Transnational Law credits, and 11 elective credits. 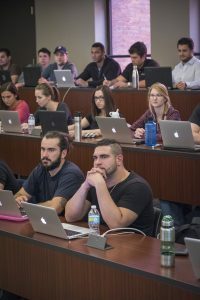 Of the minimum 44 credits through Windsor Law, students will complete 33 credits in required courses including Administrative Law, plus 11 elective credits.